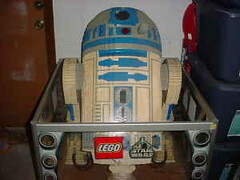 So if you're a fan of R2-D2 and LEGO, and you can afford shipping on something like this from Orlando, There's an ad on Craig's List offering to sell a LEGOized version of R2-D2. If I remember correctly, these went out to local stores (TRUs, maybe?) for the "guess how many bricks are in me" type of contests.